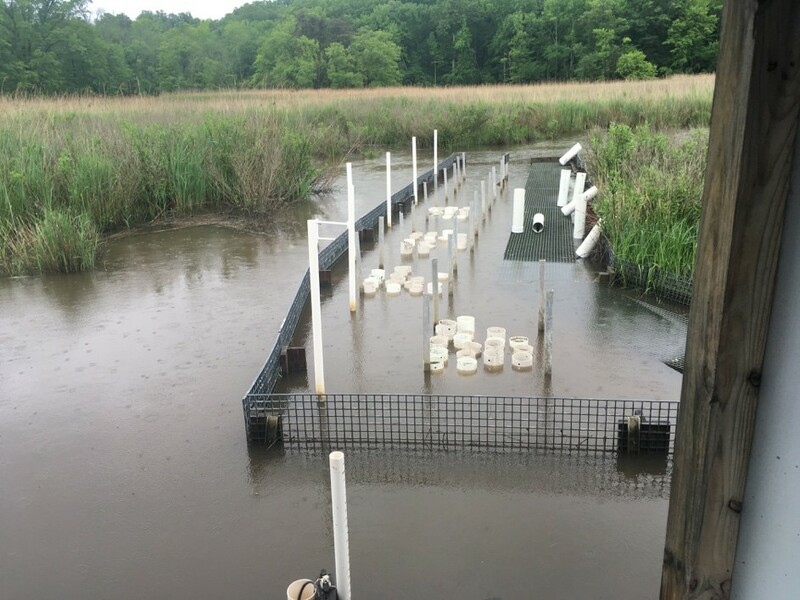 During these first two weeks of the summer, I joined Megan Vahsen (PhD student in the McLachlan lab) in the scenic marshes of the Chesapeake Bay to help set up an experiment that she has been planning these past few months. After much time the past semester acquiring sediment cores from various locations in these marshes, and sieving and germinating seeds of the marsh sedge, Schoenoplectus americanus, from this sediment, we seek to understand the role of intraspecific variation and diversity in predicting S. americanus productivity. Much as interspecific (i.e. between species) variation can explain the productivity of communities, intraspecific variation within the species S. americanus may influence its productivity at the population-level. The presence of many diverse genotypes of S. americanus sieved from a single layer of a sediment core suggests that this intraspecific diversity may confer an ecological advantage to S. americanus. An example of this advantage would be resource partitioning, in which different S. americanus genotypes occupy particular niches (e.g. genotype C might have deeper roots than B), allowing for more efficient resource acquisition by the species. Further, changes in genetic structure over time (i.e. from ancestral to modern populations) could reflect adaptive evolution in response to a changing climate. Jason (left) and Brady (right) showing perseverance in transporting and assembling experimental plots in field conditions. The plants were grown in peat contained in 60cm-long PVC pots, which were suspended in 4 wooden frames in the water, allowing for the plants to experience natural tidal fluctuations. Over the course of the summer growing season, stem counts and heights will be measured to track productivity. After termination of the experiment, aboveground and belowground biomass will be obtained from weighing stems, and roots and rhizomes, respectively. Experimental populations of Schoenoplectus americanus in PVC pots. Each population is composed of four plants from one genotype, or a variety of genotypes which were germinated and cloned in the Notre Dame greenhouse. Given the possible advantages of intraspecific diversity, we predict that polycultures will show greater productivity than monocultures. Additionally, given the change in environmental conditions over the past several decades, modern genotypes may show greater productivity if the species has strongly evolved to adapt to current conditions. These past two weeks have constituted my first authentic fieldwork experience, and the realizations I have come to were expected but perhaps not to the degree I thought. The plan seemed simple: we are going to suspend some wooden frames in the water, put some peat in PVC pipes, drop these into the frames, and plant some plants… what could go wrong? It took only a few hours out in the marsh to realize that hauling over 96 PVC pipes, 40-lb bags of peat, and heavy wooden frames would take hours. An unusually high tide results in the team rethinking how to best secure PVC pots in frames. Once delivering all these materials down a long boardwalk, we immediately had to address key questions, involving everything from physics to common sense, which would determine the success or disaster of our experiment: “How high in the water will the frame sit?” and “do PVC pots float?” The former of these questions was answered fairly easily through collaboration with scientists at the Smithsonian Environmental Research Center facility, the latter by a heart-breaking observation one morning that many of our pots, which we had spent hours filling with peat, were floating upside-down in the water. Thankfully, we didn’t lose any pots which we had needed, and the experiment is currently underway. This account of the fieldwork would not be complete without sharing our experience with nature. Although a rainy first week made the set-up a little wet and quite muddy, the sunny week ahead allowed us to appreciate the serene paradise of the marshes, which was only interrupted by the occasional deer fly attack, rat snake swimming between our experiment, or giant carp splashing for a reason still unknown to me. Overall, even though the experiment might have looked different from what I had originally imagined, our flexibility and perseverance allowed us to set up an exciting experiment which we hope will yield notable results at the end of the summer. A snake sharing the experimental workspace (left). Excited to be completely finished with the experimental set-up in late May (right).